What is art? A black-light, velveteen poster of Jesus? “Happy accidents?” A potato chip that kind of looks like Ronald Reagan? (I don’t have an MFA but all of these are definitely art, guys.) Bottom line: Art is complicated and abstract, and it might look like an old cardboard Happy Meal box. Swiss news site The Local reports that a Swiss artist named Carol May recently created just such a sculpture, which she titled “Unhappy Meal.” Unwittingly, the housekeeping employees at her Hong Kong hotel mistook the cardboard, red-and-yellow box for an actual, empty Happy Meal, and threw it in the trash. Eventually, the art was scooped out of the garbage but was deemed too damaged to be exhibited or sold. Its value was estimated at around $360. “A lot of my pieces involve very small alterations to familiar items: changes that aren’t maybe obvious at first glance,” May told The Local. Well, mission accomplished. 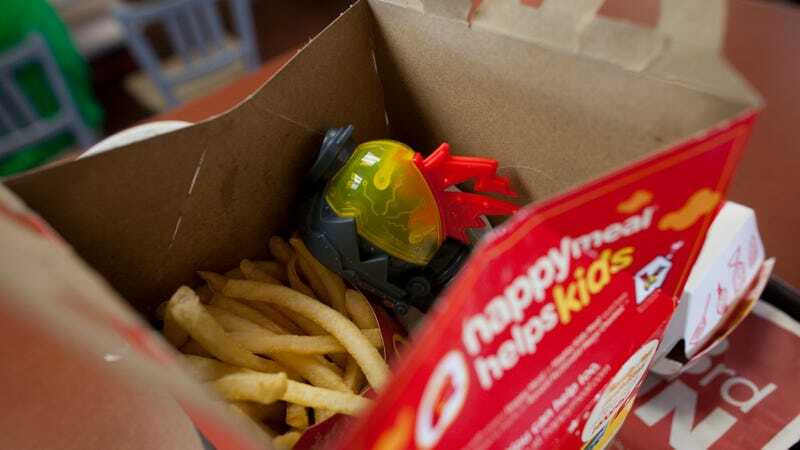 Her sculpture featured a frowning yellow cartoon mouth, rather than the Happy Meal’s iconic smile, a change meant to critique consumer culture. But the subtlety was lost on the hotel staff, who just did their jobs and cleaned up her room. May can console herself knowing that it could be worse: People probably tried repeatedly to pee on Marcel Duchamp’s best work.